Trieste, capital of the Friuli Venezia Giulia region, is a beautiful port city situated in north-east Italy. Over 200,000 people reside in this city famed for the unique blend of Italian, Austro-Hungarian and Slovenian influences on its architecture and infrastructure layout. Trieste boasts majestic attractions that include the city’s main square, Piazza Unità d'Italia, and the Trieiste Cathedral. Cheap flights to Trieste are now available for a limited period of time, so prepare to drift away into a world of fantasy as you explore this charming and diverse city! Trieste is home to Trieste – Friuli Venezia Giulia Airport (TRS), previously known as the Trieste – Ronchi dei Legionari Airport. 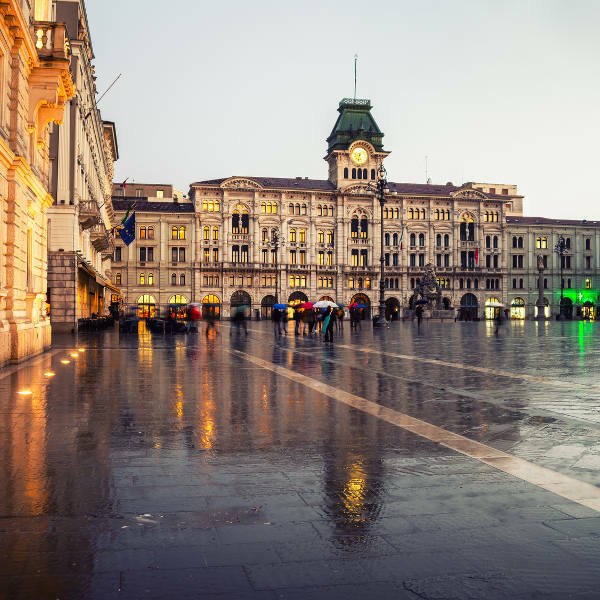 Stroll along the main city square, Piazza Unità d'Italia, situated right on the ocean’s edge, admire the beautiful municipal buildings and palaces and, if you’re lucky, catch a musical theatre show. The 19th century Miramare Castle and museum perched on a cliff overlooking the astoundingly beautiful Gulf of Trieste is a must-see attraction in this enchanting city. Relax on the banks of the picturesque Grand Canal lined by inviting restaurants and cafes where you can taste local Italian, Austrian and Slavic dishes or enjoy a cup of unrivalled Triestine coffee. Trieste’s climate zones differ in the various districts due to distance from sea and elevation factors. However, with its humid subtropical climate, the city experiences seasonal temperatures with warm summers and white, snowy winters. Sightseeing in Trieste is pleasant all-year-round as the city rarely experiences extreme weather conditions. Stroll along the picturesque seafront, discover the boutiques, galleries and restaurants around the city squares or explore the famous medieval castles like the Castello Miramare. The beautiful summer period from May to August is peak season in the city. Laze on the beaches, spend the day boating or try something a bit more adventurous like windsurfing! If you are looking to spend a little less and see a little more of Trieste when it is less crowded, try visiting during the November to January winter period as this is the city’s low season. Despite cooler temperatures, there will still be plenty to do and discover. 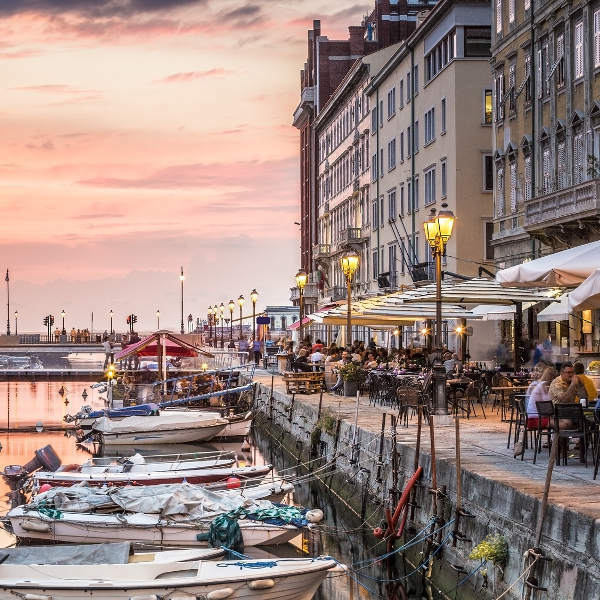 Often overlooked in favour of more popular cities, Trieste is the beautiful, lively capital of the Friuli Venezia Giulia region in north-east Italy. This enchanting port city is built on a unique history and tells a vastly diverse story through the blend of Italian, Austro-Hungarian and Slovenian influences on its architecture and local culture. Trieste boasts majestic attractions that include the Piazza Unità d'Italia, which means ‘Unity of Italy Square’. Located right on the ocean’s edge, the square is home to the city's municipal buildings, other important palaces and often hosts music and theatrical showcases. Trieiste also offers romantic strolls through its historical streets. 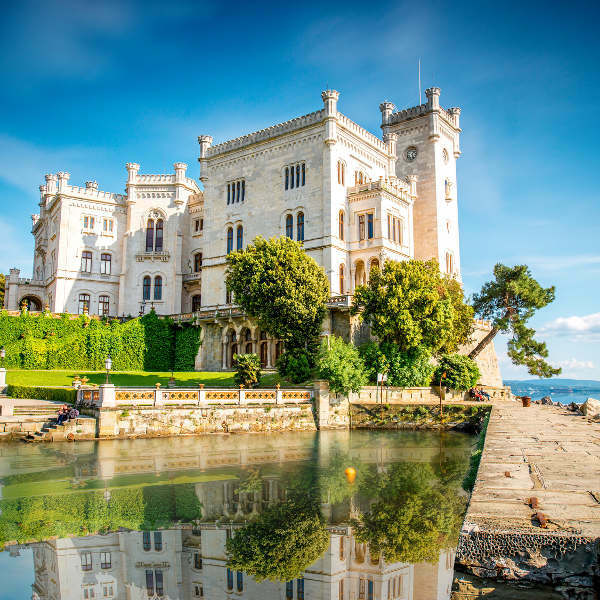 Tour the 19th century Miramare Castle and museum perched on a cliff overlooking the astoundingly beautiful Gulf of Trieste. Drift away into a world of fantasy as you explore the charming, narrow streets of the old town. Most of the town is closed to traffic so enjoy a journey through history as you explore the streets lined with medieval houses, on foot. After a long day of sightseeing and discovery, take some time to relax on the banks of the picturesque Grand Canal. The walkways are lined with many inviting restaurants and cafes where you can taste the local cuisine or have a cup of unequalled Triestine coffee. Check out the traditional buffets restaurants where you can find mouth-watering examples of local Austrian and Slavic dishes. Compare several airlines and book your cheap flights to Trieste online at Travelstart! Trieste is one of the safest cities in Italy because it is a border city and border police are often visible. Petty crime is fairly rare, however, you should still practice normal safety precautions by keeping your valuables and important documentation safe and watching out for suspicious activity. You should also keep an eye out for reckless drivers when walking in the city.